"The Korean kiss was her chance to solidify her DDS cred." 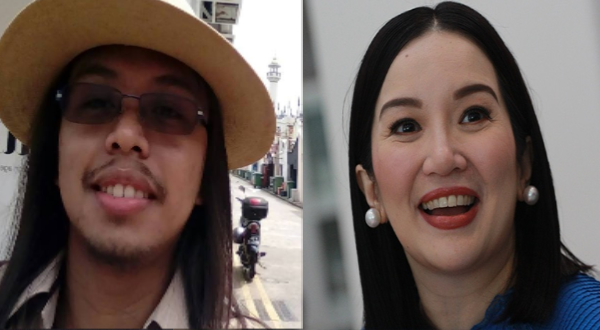 The actress and former Presidential daughter and former Presidential sister Kris Aquino could have made use of the recent talk surrounding the incident where President Rodrigo Duterte kissed a Filipina in South Korea to her advantage, if not for her desire to play the victim, said author Karlo Antonio David. Aquino previously barrated Presidential Communications Operations Office Assistant Secretary Mocha Uson after the latter uploaded a video of her late father being kissed by women before he was shot to death in comparison with Duterte's "playful" kiss with a Filipina in South Korea. David said that the move was a political mistake for Aquino. He said that Aquino "shifted allegiance to the Duterte camp" after her dispute with Korina Sanchez, the wife of Liberal Party politician Mar Roxas. David said that Aquino could've instead sent the message that, "'There is nothing wrong with Duterte kissing consenting female supporters in a convivial and non-malicious context, just as there was nothing wrong with daddy or Noy doing so." Such could have made her a crucial DDS or Diehard Duterte Supporter, had it been her statement, said David. Kris, said the author, could have become the catalyst for a pro-Duterte in the Aquino legacy, which is possible he said, with Duterte owing his political beginnings to the EDSA 1 revolution. "If she was trying to be a mole it would equally have worked better, as it would have worsened the already emerging divisions within the pro-Duterte camp over the Marcos legacy," David said. "But she instead chose to make it about her and her family being attacked by Mocha Uson, when Mocha was trying to say there was nothing wrong with what Duterte and Ninoy were doing (when Mocha Uson compares you to Duterte, you should be flattered)," he added. Aquino previously bashed Uson for the said post in a video. "Ganito na lang, babae sa babae, gusto mo ng kaaway? Ako, I’m ready. Anytime, anywhere. Harapan. Gusto mo mag-debate? Carry. Gusto mong gawin natin 'yung eksena du'n sa movie . . . 'Four Sisters and A Wedding' . . . You wanna do that scene with me? You want na ako ikaw, at ikaw bilang si Angel? Gawin natin para matigil ka na lang," Aquino said in a Facebook Live video. ""I am giving you fair warning, isa pa na bastusin o babuyin mo ang tatay o ang nanay ko, magtutuos tayo," she added. David said that Aquino could not resist playing the victim and has made herself inconsistent. "She made it about her when, as Mocha's soundbite now makes it abundantly clear, 'this is not about her.' This isn't just about bad acting, this is about bad scriptwriting," he said. Kris Aquino committed a big political mistake. She shifted allegiance to the Duterte camp when she picked a fight with Korina Sanchez. That received mixed reactions. The Korean kiss was her chance to solidify her DDS cred. That statement could have made her a crucial DDS figure: the catalyst for a pro-Duterte reading of the Aquino legacy (something which is very possible considering how Digong owes his political beginnings to EDSA). If she was trying to be a mole it would equally have worked better, as it would have worsened the already emerging divisions within the pro-Duterte camp over the Marcos legacy. But she instead chose to make it about her and her family being attacked by Mocha Uson, when Mocha was trying to say there was nothing wrong with what Duterte and Ninoy were doing (when Mocha Uson compares you to Duterte, you should be flattered). Kris Aquino could not resist playing the victim, and now she has made herself inconsistent. Katanga. This isn't just about bad acting, this is about bad scriptwriting.